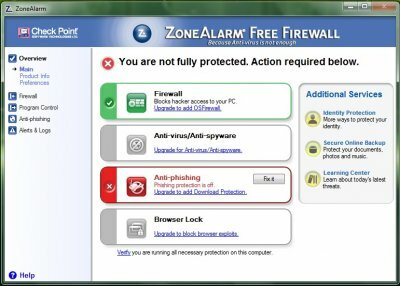 Zone Alarm is an easy to use firewall blocks hackers and other unknown threats. Zone Alarm Intrusion Blocking systematically identifies hackers and blocks access attempts. Stealth Mode automatically makes your computer invisible to anyone on the Internet. Automatic Program Configuration provides safety and simplicity by automatically configuring programs. Automatically decides whether to allow or deny Internet access to individual programs. Expert Controls give savvy users precise control over security settings. PC Spy Monitor secretly monitors Facebook, chats, emails, keystrokes, passwords and sends reports to your email. It logs Skype, Yahoo Messenger and other IMs. It runs so stealthily that the monitored user won`t know it. Micro Keylogger is an invisible keylogger for Windows that secretly records keystrokes, passwords, websites, clipboard texts, downloads, applications and more. All the logged data will be delivered to preset Email or FTP space for remote checking.